I’m still here. Even though I don’t post much these days. Thought I’d pop in today to say “Hi” and thank everyone who’s read Null Pointer. 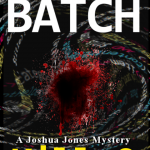 I’m still planning on writing the next Joshua Jones novel – Kill Dash Nine, although I’m not sure exactly when that will be. 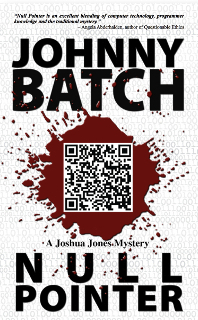 In the meantime, if you haven’t read the short story “The Safe Cracker” featuring the detective in Null Pointer, give that a read. Of course the best way to force my hand at writing the next novel would be to start a word-of-mouth campaign that results in big sales numbers. Hint, hint. The ebook for Null Pointer is still only .99 cents and the paperback is available just about anywhere for less than ten bucks. Can’t beat that. I have several loaner copies that I pass out whenever I can. Most coders really enjoy it. Mystery readers are tepid to it though. There’s not a real big audience for programmer sleuths out there. Knitting grannies are apparently far more interesting amateur sleuths. 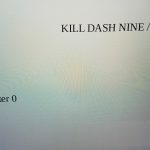 I have two other novels I need to finish before I can write Kill Dash Nine, so hopefully I’ll start writing about white collar crimes again in 2015. Until then, thanks again for reading! My good friend Nate McIntyre visited TWiT this Sunday and gave Leo Laporte a copy of my book. I hope he gets a chance to read it or at least pass it on to other folks who would like it. 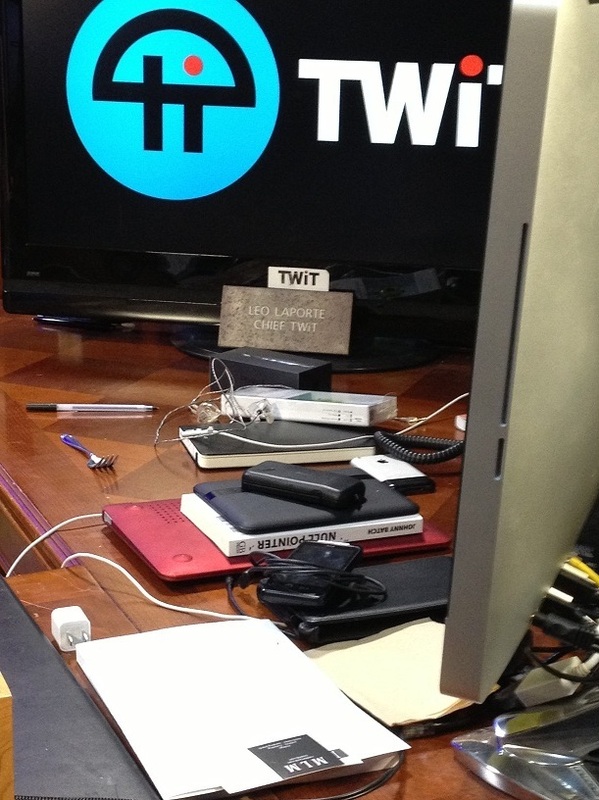 Here it is on the Chief TWiT’s desk. How cool is that? We’ve lowered the price for the Null Pointer ebook in an effort to increase sales. At the moment, there are no plans to bring the price back to $2.99 or higher. There are also no plans for another novel in this “series” to be written this year. I might get to the second novel in 2013, but I’m not going to commit to it. Another short story might come out later this year or early next year. 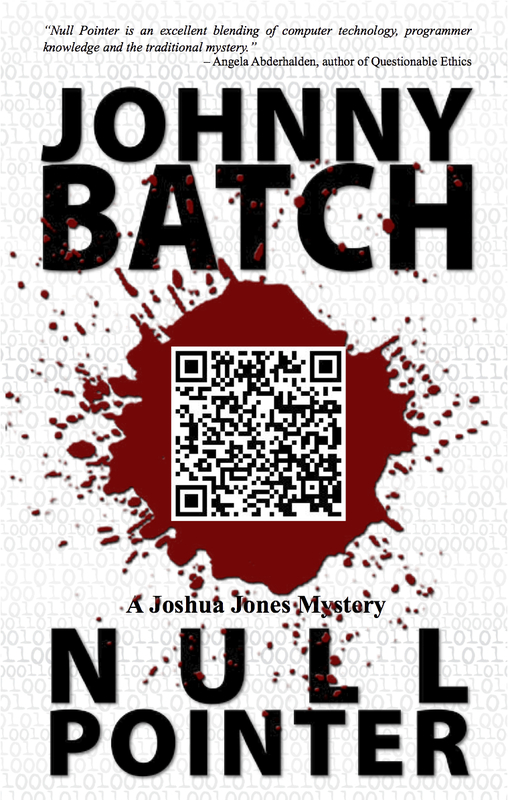 You can still get Null Pointer in paperback at Amazon and it’s only $9.96! The paperback version is very slick. If you want to see this series eventually written, buy the paperback and convince all your friends to buy it or the ebook. The more demand for a sequel there is, the greater the chance I will make the time to write it. Hello, is this mic on? I’ve been away from the blog for a few months. Heck, since August. But I’m still kicking. Just not writing much crime stuff these days. 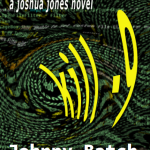 I hope to begin work on the next Joshua Jones novel some time late next year. Got other things occupying my brain case at the moment. I appreciate the sales of Null Pointer over on Kobo. Welcome new readers! Rest assured I will eventually get back on the horse and start writing again in 2012. In the mean time, I want to take this opportunity to pimp someone who is writing and is damn good. Seth Harwood. If you like crime novels, you will love his Jack Palms series. Go now, get his books, read them and tell him Johny Batch sent you. I’m ready for my signing at Rediscovered Books on First Thursday next month. I ordered an even twenty so I could have some leftovers on hand for emergencies. Here they are, all boxed in, five per stall. I’ll be doing a book signing at Rediscovered Books on 8th Street, in Boise next month. I’m the featured author for First Thursday. Looking forward to meeting and talking with the people of my home city. I’ll be selling and signing copies of my mystery novel, NullPointer. So tell all your friends to come out and see me and get the latest paperback version of Null Pointer. Calling all fellow writers and readers. Popular Fiction Assoc. of Idaho who puts together the Mayhem in the Grove conference (formerly known as Murder in the Grove) are seeking new members to join our group. Since our conference is now open to all genre fiction, we would like to invite people from all local writing groups to join us at this informational meeting. During this meeting we hope to map out the future of the Mayhem in the Grove conference and the nonprofit organization. We work together to bring to Idaho creative workshops, coveted agents and editors and our favorite authors.This is your chance to be a part of something incredibly fulfilling and challenging. Over the years we have had some tremendous talent come to the Treasure Valley and we want to keep that spirit alive by bringing in new members with new and fresh ideas. Come to our meeting at Hastings located at Overland and Five Mile on Saturday August 20th, 7:00 pm. Bring your ideas and your enthusiasm and join us. If you have been thinking about becoming an Amateur Radio operator, I invite you to watch or listen to the latest show on the TWIT Network – HamNation. The show is co-hosted by Bob Heil and Gordon West, two pillars of the Ham community. It’s a great show and a fun way to get introduced to the hobby. This is a screen shot I took of Bob from the latest show. 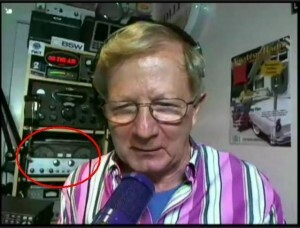 I circled a rig behind him, because that’s the radio I described in detail in my novel, Null Pointer. A Hallicrafter’s receiver. This is an article I wrote shortly after my father died. It explains why I have my Amateur Radio license and describes my dad and how Ham radio was the river that ran through his life. It was first published on the eHam.net web site back in 2005. More after the article. When I was a teenager, I took to creative writing. I wrote fanciful Science Fiction stories and did a lot of daydreaming about adventurous deeds done by heroic people. My father always told me that real life was more exciting than fiction. It must have been my youth, but I never really believed him at the time. My father was a very practical man. He always fixed things himself and worked hard in his career to teach himself what was needed to get his job done. He never liked to sit around and watch TV or go to the movies but he loved to play the piano and expressed his creativity by inventing new things out in the garage. When I was five or six years old, he built a remote control car from scratch. It took him several tries but he wound up with a battery powered radio controlled car well before you could buy such toys in the stores. My dad always had a talent for things electronic in nature. When he was a small boy, he modified a toy train to start and stop by talking to it. His parents and relatives thought it was magic. By the time he graduated High School, my father had become an Amateur Radio operator and had built every radio he used from scratch. Someone once told me that my dad had built his first radio from a hog trough. Having lived on a farm in Iowa all his youth must have been like living in a prison for his creative mind. He once told me that he had designed a way to automate the plowing of his father’s fields by using a tractor that followed a wire buried deep in the ground. He never got that one working as the plow would dig up the wire. His intense interest in technology would lead him off the farm and into a future that would become increasingly reliant on electronics. After High School, he took one semester of college and quit. Didn’t like the English and Math 101 classes. So he took a job at Collins Radio in Ames, Iowa. There he met a student named Harold Nelson, a fellow Ham. Harold recalls my dad as being a very gifted radio designer who knew more about the Collins radios than some of their engineers. It was while working for Collins and helping to put together a large government equipment order, that my dad learned where the equipment was heading. It was to be used in South America as part of the Geodesic Survey for 1958. My dad asked if they needed any help and they replied that they were in deed looking for a technician to be in charge of the equipment and assist a Physicist in taking measurements in regards to radio wave propagation. My dad signed on and after three months in Bolder Colorado for training that included learning Spanish, he was on a barge drifting down the Mississippi to New Orleans. Once in South America , my dad found out that be needed to hire body guards to protect himself and the expensive radio equipment from the bandits in Chile. The protection amounted to a few natives and their extended families. A letter back to his bosses in the States approved the expenditure of hiring the guards. My dad latter said that what he paid them was more money than they would normally have seen in a years worth of work. The extended family lived right beside my father’s trailer for the entire year he was there. It wasn’t until he left South America that he learned that the body guards he had hired were actually the bandits that he was warned about. While my dad was in South America he would call back home to Iowa and talk with his parents on Amateur Radio equipment given to him by the government. Harold Nelson volunteered to act as the operator in charge letting the family talk to their son, half a world away. Over the course of the year that my dad was gone, Harold became quite close to the family. Some days the conditions allowed for only an hour of talking, other times the band would stay open all day. One by one my dad’s relatives and friends would come over to the farm house and talk with my dad on the radio. Harold remembers seeing my grandfather waiting for him in the window and as soon as he saw Harold’s green car coming down the street, my grandfather would go turn on the radios and by the time Harold was parked and at the door they were warmed up and ready to talk. Harold remembers the conditions were often very favorable and like clockwork, he would call my dad’s overseas call sign and my dad would respond. It was all magic to the farmer and his wife, but it was good magic that let them talk to their son, so far away. As the year progressed, my grandfather developed heart problems and by the end of the year the Doctor’s realized that he didn’t have long to live. Harold got the news late one evening and immediately turned on the radios to contact my dad. But he was not listening. Then Harold remembered that my dad would be checking in with the bosses at Bolder on a military frequency. His radio could tune that band and he quickly changed over to hear my dad reporting. It was not legal for Harold as a Ham to talk on the military frequency and he was very nervous about interrupting them. Putting the nerves aside, he broke in and gave my dad the sad news. The bosses in Bolder got on the phone immediately and had my dad a flight home within two hours. Then they told Harold to get off the frequency and go back down to the Ham bands to let my dad know the details. Harold said it was the toughest thing he’s ever had to do and he remembers it like it was just the other day. My dad got off the plane in Miami and called home, worried about his father’s condition. He was too late, grandpa Ken had passed away. The last time my father had heard his dad speak was on the military Ham radio. Years would pass, and my father stayed in the radio business, retiring as the Senior Products Engineer at Regency Communications. He later married, had two kids and raised them, traveling from one end of the country to another. All the while he held on to the little black military radios that he had last heard his own father speak to him from. This past year my father contracted a cancerous brain tumor and died within a month after becoming ill. I last spoke to him on the phone, two weeks before he died. The tumor spread from his lungs that were as black as a chain smoker from second hand smoke. My dad never smoked a day in his life. But the other engineers he worked with did and over a 20 year career, that adds up. Up until the last few weeks, we thought he would pull through it with radiation treatment. But the cancer was too strong and late one evening I got the call from my mother to come quickly. I got on a plane the next morning and flew to Arizona where they lived. A good friend of my dad’s came and got me and raced me back to the hospital nearly getting a speeding ticket in the process. I made it to my fathers side in time to be with him as he passed away. Something that he was never able to do for his dad. That was important to my family. 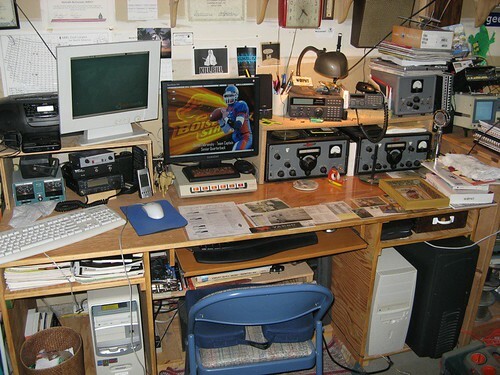 I had never been too interested in getting my Ham radio license until after my dad died. It just didn’t seem right that his call sign, the same one he had when Harold had contacted him in South America, would go back into the pool and be assigned to a stranger. So I vowed to get my license and then take his call as my own. Three months later I was WØPHT and the custodian of the family history it represented. All those years of listening to my father’s radios in the garage and watching him talk to people all over the world had rubbed off on his oldest son and I now eagerly participate in the Amateur Radio hobby. All the radios I own are the ones my father had and used right up until his illness. Many of the rigs were designed or built by him. I made a pilgrimage back to my mother’s house and filled up my station wagon with all of my dad’s remaining radios and antennas. I brought them back and built a new desk in my garage/ham shack to hold them. There was one set of old radios that he had held on to, all those years and I never knew exactly why. They were painted black and were military copies of Collins Radios. Complete with military frequencies and Ham frequencies. Nobody knew what they were for, but my dad always had them tucked away in the electronic junk in his garage. Recently, I had the pleasure of speaking on the phone with Harold Nelson from his home in Arizona, not far from where my mother lives. In talking about the whole adventure he had with my father’s family, he told me about the radios that the government had given to my dad to talk back to Bolder Colorado with. He said they were a copy of the Collins radios called Eldico, with both military and Ham frequencies. Low and behold, I had the very same radios that my father had last spoken to his father on back in 1958! Needless to say, I will not be parting with those particular radios. I’m currently studying for my next level of Amateur license so that I can talk to Harold on the very same radios he spoke to my father from all those years ago. I don’t know if my sons will ever become Hams, but my hope is that at least one will, so he can keep the call sign – WØPHT, and the radio in the family and pass them down to future generations. Who knows what further adventures lie in wait for those old radios? What ever happens, it’s a fair bet that it will be far more interesting than any fiction I will ever write. If you have read my first Mystery novel, Null Pointer, you now understand why I have such an elaborate description of Steve’s radio shack. It’s a tribute to my dad. His garage was just like Steve’s shack, minus the gun stuff. I grew up by the light of glowing tubes and the crackle of HF static, listening to my dad call CQ on his home brew radios. If you are a Ham radio operator, you will love Null Pointer. If you have ever been curious about Ham radio, perhaps like Joshua Jones, you will tune in and discover the magic of talking over radio waves to far away lands. If you read my novel, and enjoy it, please give me a call on the radio and tell me. I love talking to fellow Hams about the book. You can also send me an email at: ken.mcconnell_@_gmail.com, careful to remove the underscores. Thanks and once again, 73’s.